"This is one of the easiest side dishes I've found. I don't even like most tomatoes, but I love these sweet little cherry tomatoes. This is the basic recipe, but you can also add slivered garlic to the roasting pan and/or chopped fresh basil and Parmesan cheese at the end. Very good with pasta!" Whisk olive oil, balsamic vinegar, salt, and pepper in a large bowl. Add cherry tomatoes; toss to coat. 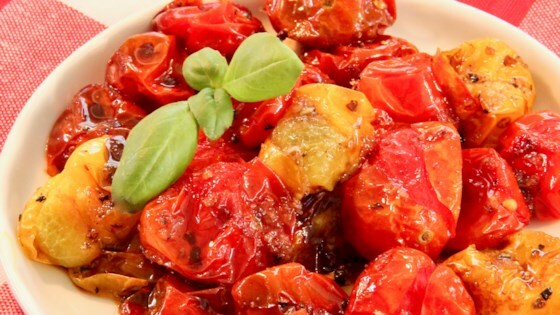 Spread cherry tomatoes in an even layer on a rimmed baking sheet. Roast until skins are slightly shriveled, 35 to 40 minutes. Added fresh minced garlic & fresh basil. Very easy, quick, and delicious! Also great way to use up cherry tomatoes from my garden. Thanks for sharing this one!! !